Dinosaurs Before Dark is the first Magic Tree House book, written by Mary Pope Osborne. S.T.W. has a collection of reading comprehension questions, project ideas, and literature circle role sheets to go along with this story. Most of the worksheets on this page align with the Common Core Standards. To see Dinosaurs Before Dark CCSS connections, simply click the common core icon . Answer seven comprehension questions to check your understanding of chapters one through three. Includes questions about the setting, finding the magical tree house, and Jack and Annie's adventures with the pteranodon. Which character in the story are you most like? Are you generally a careful person, like Jack, or more a adventurous person, like Annie? This printable has a picture of Jack looking out of the trees house and seeing a giant Pteranodon. 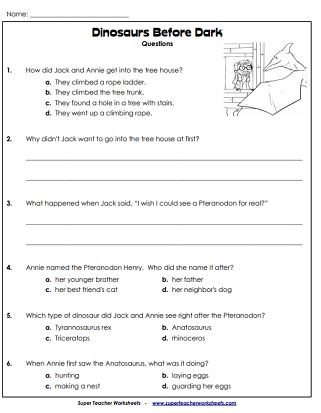 These six comprehension questions focus on Jack and Annie's prehistoric encounters with the Pteranodon, Anatosaurus, and Triceratops. This worksheet has an illustration of a large Anatosaurus. Jack is fearfully hiding behind Annie as they look up at the dinosaur. The questions on this worksheet cover the last four chapters of the book. Students answer questions about Jack's escape from the Tyrannosaurus rex and their magical return home. An angry T-rex towers over Jack and Annie in this graphic. Answer questions about Jack and Annie's adventure to prehistoric times. This worksheet covers all ten chapters of the book. A set of four illustrated bookmarks, featuring scenes from Dinosaurs Before Dark. In this whole group activity, students will search the classroom for fun facts about Mary Pope Osborne and her Magic Tree House books. Write a brief summary of the assigned chapters and share it with your group. Create open-ended discussion questions for your group to talk about. Draw a specific scene from the story. Can your group members tell you what's happening in the illustration? Tell how events from the story remind you of something that's happened in real life. Choose tough vocabulary words from the reading selection and define them. 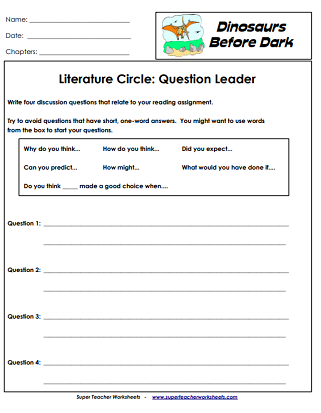 This sheet can be used as a cover page for your literature circle packet. Here's the unit for the next Magic Treehouse book, The Knight at Dawn. Download question worksheets, bookmarks, a word search puzzle, vocabulary activities, and a compare/contrast activity. Browse chapter books by title to find more reading worksheets. Titles include: Bunnicula, Stone Fox, Tales of a Fourth Grade Nothing, Freckle Juice, Junie B. Jones, Cam Jansen, and countless others. 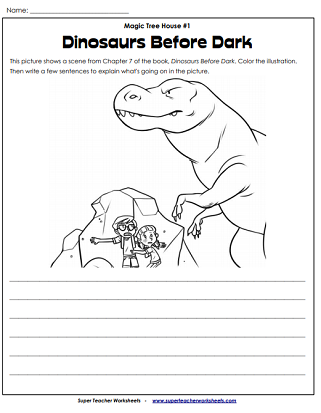 When reading Dinosaurs Before Dark, you may want to use these general dinosaur worksheets as well. This page features dinosaur reading comprehension articles, a word search puzzle, dino math, and more. We also have a vast collection of phonics, grammar, spelling, and reading comprehension worksheets.